The Space Situational Awareness (SSA) Programme is being implemented as an optional ESA programme with financial participation by 14 Member States. It began in 2009, and the programme's mandate was extended to 2019 at the 2012 ESA Ministerial Council. The second phase, Phase II, of the programme is currently funded at 46.5 million EUR for 2013-16. Each of these activities is being developed as 'segment' (analogous to a satellite's traditional 'ground segment') in parallel sets of capabilities and services, supported by data centres and a Tasking Centre with contributions by existing European infrastructure. The current Phase II activities place increased emphasis on developing space weather and NEO services, while research, development and validation activities continue in the space surveillance and tracking domain. The SSA Programme Office is based at ESA's ESAC Establishment, while technology research and development, project planning and industrial contracting are being conducted by teams located across the Agency, particularly at ESOC, ESRIN and Redu. During Phase II, system development work initiated during the 2009-12 Preparatory Programme will continue with the goal of progressively prototyping, developing, testing and validating the main components of the future European SSA system. The NEO segment will continue observing/scanning for NEOs, predict their orbital evolution and impact risk, store observational and calculated data, issue NEO information, news releases and impact warnings and support NEO mitigation measures in close coordination with international partners. In the future full SSA system, the NEO segment will conduct a nightly scan of the complete visible sky with the aim of detecting objects that are only visible when they are close to Earth. Such a 'wide survey' is complementary to the 'deep survey' being undertaken by NASA (which aims to detect all NEOs larger than a given size). For newly discovered NEOs, follow-up observations are required to confirm the discovery and establish the orbit. The NEO segment plans to establishment the ability to perform such observations using various European observatories under service agreements. The Klet Observatory as the cooperating sensor of Space Situational Awareness programme SSA-P2-NEO-IV will perform follow-up observations of NEOs published on the NEO Confirmation Page of the Minor Planet Center and, with second priority, of objects on the Spaceguard Central Node's priority list . In addition, the Klet Observatory as the contractor will be available in certain time slots for special follow-up requests, e.g. when survey observations at ESA's OGS telescope generate objects which should be followed-up even before being posted to the NEOCP. The measurements obtained by the Klet Observatory will be sent in a timely manner to the Minor Planet Center, with copy to the Technical Officer of this ESA contract. The Klet Observatory (South Bohemia, Czech Republic) pursued the CCD astrometric follow-up of Near Earth Objects including confirmation, early follow-up, long-arc follow-up and recovery of NEOs since 1994. In 2002 the KLENOT Project has been started to improve the long-term NEO activities at Klet towards more effective work on fainter and faster objects. The main instrument of the KLENOT Project is 1.06-m KLENOT Telescope (IAU MPC code 246), smaller 0.57-m reflector (IAU MPC code 046) is used for brighter objects. Tens of thousands astrometric measurements helped to inventory of NEOs as well as to understand the NEO population. 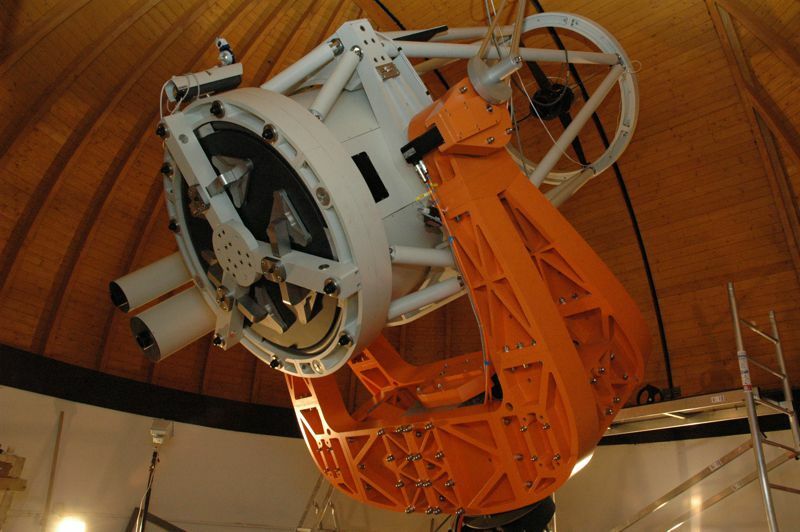 The significant upgrade of the 1.06-m KLENOT Telescope was started 2008. It covered building of new computer controlled mount for the KLENOT Telescope as well as the purchase and installation of the new, more advanced CCD camera. KLENOT Team uses special software package containing tools for observation planning, data-acquisition, camera control, data processing and orbit calculation, which was developed just by the Team. The tools are linked in between each other and our SQL database and they leave our servers to do most of the processing. KLENOT image processing is made in almost real time. All obtained image sequences are checked visually by an observer experienced in image processing. Full observing time is dedicated to the KLENOT team, so it is possible to make very quick changes in an observing plan, even during a given observing night. The Klet Observatory KLENOT team consists of 4 members now: Jana Ticha (P.I. ), Milos Tichy, Martin Janda, and Michaela Honkova as an external member. The work of the Klet Observatory KLENOT Project resulted in total of 56 471 astrometric measurements of 6 453 bodies from 2002 to 2014. It contains 13 992 astrometric measurements of 1 474 NEAs, confirmation and astrometry of 702 NEAs from NEOCP, recoveries of 4 comets and 16 NEAs, astrometry of 167 Virtual Impactors (CLOMON, SENTRY) as well as discoveries of 776 new asteroids, including 3 NEAs.